Software systems and software development itself make use of various technological spaces, e.g., relational databases, XML technology, ontologies, and programming languages. The usage of several technological spaces in a single system or development process requires a proper bridging between them. “Bridging” can be achieved by transforming concepts of one space into another, by using an adapter to make concepts of one space usable in another, or even by integrating both spaces into a single one, for instance. 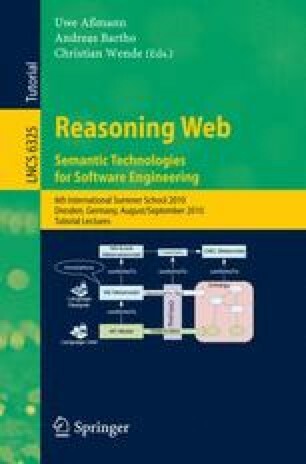 This paper presents a transformation-based bridge between the query languages SPARQL and GReQL, with SPARQL originating from the semantic technological space and GReQL representing the model-based space. Since transformation of queries requires the prior mapping of the queried knowledge base, the approach also involves transforming the underlying data in the form of RDF documents and TGraphs, respectively. The benefits of the bridge are shown by applying it for traceability. This work has been funded by the European Commission within the 7th Framework Programme project MOST no. ICT-2008-216691, http://most-project.eu .